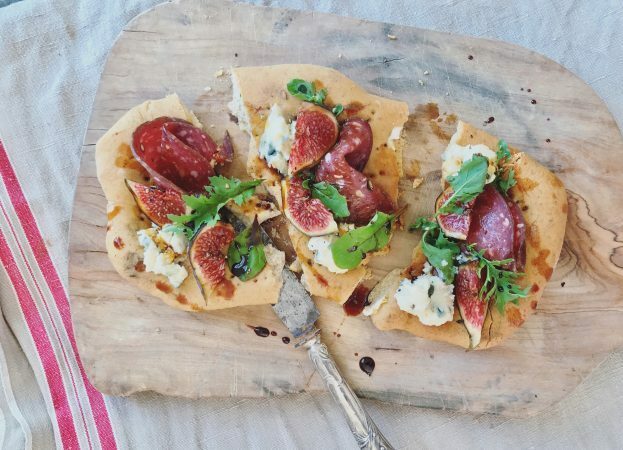 We love making these flat breads and they are so on trend! Make a pizza dough with either yeast or sourdough starter and let prove to double in size. Divide the dough in golf ball size balls and roll them into a rectangle. Let them prove for 30 minutes then prick the middle with a fork to flatten and bake in a very hot oven. You can do this in advance and top later. We topped them with slices of Green Pepper Venison Salam, crumbled blue cheese, quartered figs, salad leaves and a drizzle of Balsamic.